Plumber? Builder? Plasterer? Multi-trader? Want to add tiling or decorating to your skillset? 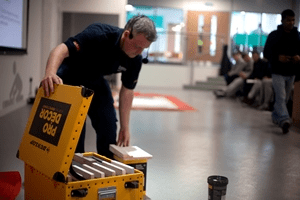 Dunlop – specialist manufacturer of tiling, flooring and decorating products for the trade – is calling on tradespeople to sign up to its new training courses. Held at the company’s state-of-the-art Innovation and Technology Centre in Stoke-on-Trent, the training courses provide tradespeople with up-to-date knowledge on the latest products and installation techniques. Led by Dave Rowley, Dunlop Training Manager, and members of the company’s technical team, one to five-day practical courses are available to tradesmen and women this March and June. Training techniques include presentations, workshops, demonstrations and hands-on practical training within individual working bays with mock-up windows, pipework and toilets for example, designed to reflect real life installations. Throughout the course, delegates will mix and use professional adhesives, grouts, fillers and smoothers onto realistic backgrounds. Dave commented: “Training is a key priority at Dunlop, and we believe it is important to give tradespeople – whether they are new to the trade, at college, or have many years’ experience – the opportunity to learn about the latest technologies and installation practices to enhance their skills. And takes place from 6-10 March and 26-30 June 2017. Dunlop operates a flexible approach to training, with tradespeople having the ability to book individual days or group days together as they please throughout the year. On completion of the course, delegates will receive a certificate of attendance, literature, merchandise and product worth more than the cost of the course. To book on this course please CLICK HERE.